Yea, you did stupid asshat. Interesting Research by the University of Haifa in Israel studied online interaction and on social networks and forums found isn’t anonymity that promotes trolling online, but lack of eye contact. The Researchers found that people are twice as likely to troll if they don’t have eye contact with the person they’ve targeted for trolling. I can relate because I’ve been one of those targets/victims. On the whole it does make sense, when you think about it. People don’t really communicate with someone they can’t see in most situations. It’s been noted that while using Google Hangout and Skype/FaceBook chat that trolling and negative outbursts are severally reduced due to the fact you are visually seeing the person for who they are. 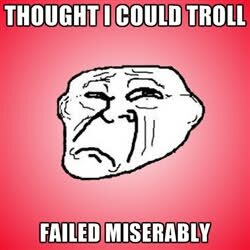 Trolling because you can’t see the reaction trolling causes your victim/target is shameful and should be punishable in some form is how I see it, and maybe then there might be some reduction in persecution towards others out there. Tis not a Good day to die as of yet……. Ok, so I’ve been away for a week or so. Deal, I’ve been doing some music research thing for my oldest for her science fair project on the behavioral patterns based on music the subject listens to. Finaly got that taken care of last night. Girl scout cookies are selling now and I have to try to help my little ones out by seeing if anyone at work would want to order and seems like a good time is being had by all on this one. Good for me! Project is starting to go well, Paulo has been able to recover 3 of the 5 weapons that were missing. Bad news is they’re just the models and textures, they were not the fully coded versions. I did search however. This however does save us time on having to build from scratch and saves us a little bit of time. niteFlarer is doing an excellent job on rebuilding the lost player models we had from the original project. He’s started on leon’s shoes and trousers, minus the belf which I think will be with the bottom part of the torso. Whoch should look good when the model turns the belt wil move with the torso. So good body movement on that. We were also debating on whether or not to use cityengine to help port over the Megatokyo BSP map or just to build from the BSP and add in the statics as we go along and build from the inside of the buildings from top to bottom and place in floorplans as needes. Waiting on Joseph now on the firebee progress but we haven’t heard from him in like almost a month. During a search on Voomer designs and such ran across some of the OLD ova Genom designs BU-33 and BU-11 designs and a few vehicle designs that might actually prove to be fun if we can get them built/animated/rigged and then in game for flight testing. MIT has prototype Cybernetic Eye enhancements. Cybertechnology strikes again, The guys at MiT are at it again! eyesight research thru cybernetic technology is on the run again. The reasearchers have invented a prototype that should be in production on a limited run for the test focus group. Very cool aspects wih regards to this, the chipset will probablly be smaller by the time for testing is ready. according to the article this wil last up to ten yrs. But afterwards what will be the process for maintance so it will last another 10 yrs on top of that? Using the person’s own eye and the technology the chipset will use electronic impulse signals to the optical nerve to be translated into visusal graphics. There will also be teh use of eyeglasses that will have a battery feed to the device. This may not restore 100 % sight, however it will restore sight in theory so far to a level where one can navigate without tripping over things and people and may very well be able to tell one person from another. Again, shades of shadowrun/cyberpunk technology are at hand in the media again. I am glad to have survived this long so far myself. Maybe I’ll even be able to create something useful before I pass from this life to the next? One can hope can’t one?